The Minister of Defence of Ukraine invited his British college to visit Kyiv during the celebration of the Independence Day of Ukraine. 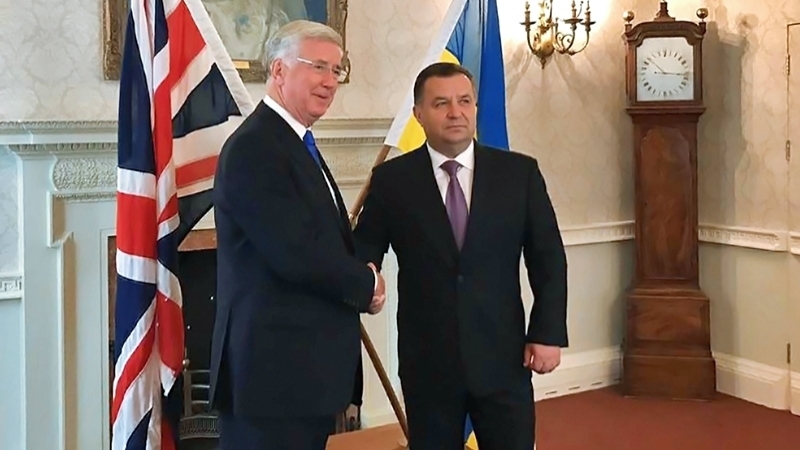 The Secretary of State for Defense of Great Britain Sir Michael Fallon and Minister of Defence of Ukraine General of the Army of Ukraine Stepan Poltorak discussed the security situation in Ukraine and in the world in London, the press service of the Ministry of Defence of Ukraine reported. “The parties discussed the current security situation in Ukraine and around the globe during the meeting”. Minister of Defence of Ukraine Stepan Poltorak informed his British counterpart about the state of Armed Forces of Ukraine reform process and the role of British advisers who worked in Ukraine and provided consulting assistance in the reform process. “It would be very difficult without help of our advisers and I would like to thank for their work, I’m also satisfied with the level of training conducted by the UK instructors. It is necessary to continue this process”. The British assistance in the establishment of NCOs colleges in Ukraine was also discussed during the meeting. “Reforming of the training system of this category of servicemen is necessary and very relevant”. Stepan Poltorak invited Michael Fallon to visit Kyiv during the celebration of the Independence Day of Ukraine. Earlier, Ukraine and Turkey made agreement on strengthening of military cooperation.